What is the purpose of the water base 6 post plastic chain kit? 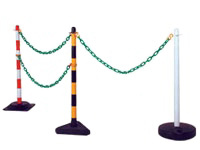 The water base 6 post plastic chain kit is an ideal solution to the problem of an external temporary fence. Constructed out of high-quality materials and designed for both interior and exterior usage, the plastic barrier kit is a very economical option for companies that only need temporary cordons. The bases can be emptied in order to make the posts easier to carry. 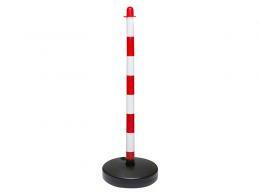 This makes the kit a mobile fence system that a company can utilise for whatever needs it may have. Where can this plastic maintenance barrier be used? The water base can be filled with either water or sand to increase the inherent stability of the posts as a system. This makes it ideal for use both inside and outside. In exterior use, the rugged construction means that it can stand up to whatever battering the elements can provide to it. The white and red alternating colour scheme gives the posts and the chains very high visibility, even in the worst weather. Businesses that require crowd control or the formation of queues may make use of this kit to set up delineations. The posts and chains are lightweight and easily assembled. Once a company acquires the kit, they can quickly erect the partitions between queues. In the event of a shuffling of its floor plan, the posts can be moved easily without sacrificing stability. Additional kits can be utilised as a scalable solution should the business require more queues to be established. 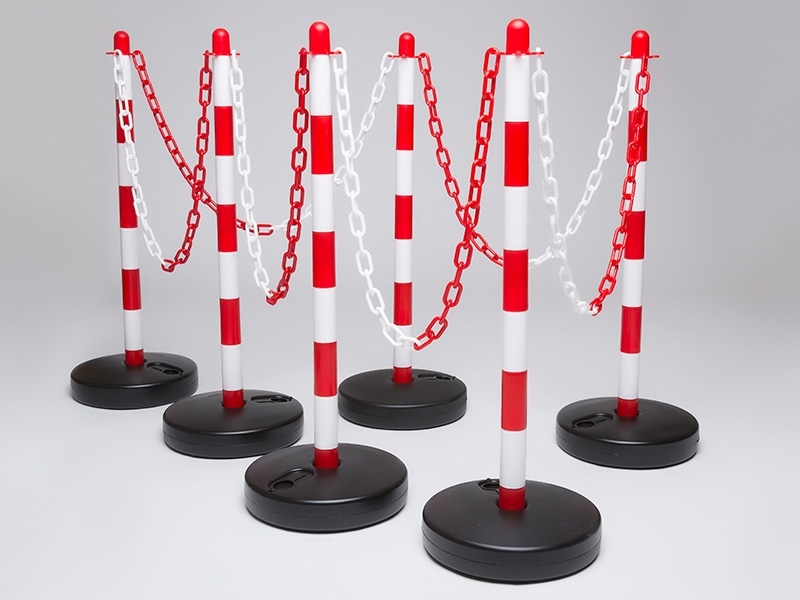 This water base 6 post plastic chain kit comes with the posts and bases pre-assembled. The posts stand at 880mm tall with a diameter of 40mm and the bases rise up 75mm from the ground and have a diameter of 300mm. The chains are also painted red and white alternating colours to match the posts and come in 2m lengths. Included are the s-hooks and the connectors needed to mount the chains on the posts.